It was the fate of the Copp brothers to die in action miles apart on the same day - how terrible for their parents. 29947 Private Edward George Beer of the 1st/5th Battalion, the Duke of Cornwall's Light Infantry; formerly 8/1298 of the Territorial Reserve Battalion. Son of George and Elizabeth Beer. Born in Bradninch in 1899. Died 20 April 1918 aged 19. R/2556 Able Seaman Harry Bowden of Anson Battalion, the Royal Naval Division. Son of Mary Ann Bowden (w); husband of Alice Bowden of Peter Street, Bradninch. Born in Bradninch 25 December 1882. Died in France 26 October 1917 aged 35. L/6921 Officer's Steward 3rd Class Ernest Bryant of the Royal Navy, HMS Vivid (Shore Establishment). Step son of John Radford and Annie (formerly Bryant) Born in Bradninch in 1898. Died 28 June 1918 aged 20. Buried in Bradninch churchyard extension. 30626 Private (Frederick) John Burrows of the 8th Battalion, the Devonshire regiment. Son of Frederick and Elizabeth Burrows. Born in Bradninch in 1898. Died 28 June 1918 aged 20. 7645 Private Edwin Chamberlain of the 1st Battalion, the Devonshire Regiment. Son of Fanny Chamberlain and the late Edward Chamberlain. Born in Silverton in the March Quarter of 1897. Died 25 October 1914 aged 28. 40522 Private Frank William Coleman of the 6th Battalion, the Northamptonshire Regiment, Husband of Li.ly Coleman. Born in Cullompton in the march Quarter of 1879. Died 22 March 1918 aged 39. J/85500 Ordinary Seaman Frederick James Collins of the Royal Navy, HMS Vivid (Shore establishment). Son of John and Lottie Collins of Manor Cottage, Bradninch. Born in Hillingdon, Middlesex in the March Quarter of 1900. Died 3 April 1918 of illness (Influenza?) aged 18. 20042. Private Sidney Archibald Copp of the 2nd Battalion, the Devonshire Regiment. Son of William and Polly Copp; brother of Tom (see below). Born in Silverton in the June Quarter of 1894. Died 1 July 1916 aged 22. Note: this was the same day on which his brother met his death. 20402 Private Thomas Copp of the 9th Battalion, the Devonshire Regiment. Son of William and Polly Copp; brother of Sidney (see above). Born in Bradninch in the September Quarter of 1885. Died 1 July 1916 aged 32. Note: this was the same day on which his brother met his death. 33169 Private Albert Emmanuel Daniels of the 2nd Battalion, the Devonshire Regiment. Son of Francis and Fanny Daniels; husband of Rose Daniels of Exeter Road, Cullompton; brother of Albert (see below). Born in Bradninch in the March Quarter of 1892. Died 20 June 1917 aged 25. 241926 Corporal Frank James R. Daniels of the 2nd/ 8th Battalion, the Worcestershire Regiment. Son of Francis and Fanny Daniels; brother of Albert (see above) Born in Bradninch in 1886. Died 10 June 1918 aged 32. 19161 Corporal Alexander James Don of "D" Bty, the 52nd Brigade, the Royal Field Artillery. Son of Mary Don (w) who came from Scotland to work in the paper factory at Bradninch. Born in West Ham in 1882. Died 16 May 1917 aged 35. Awarded the Military Medal. 1007 Private Charles Eli Drew of the 1st/4th Battalion, the Devonshire Regiment. Son of Eli and Annie Drew of Cullompton. Born in Cullompton in 1889. Died 8 March 1916 aged 27..
2540 (S) Private Stanley Elliott of the Royal Marine Training Unit, the Royal Naval Division. Son of Henry and Susan Elliott; brother of Victor (see below). Born in Cape Town SA 17 November 1894. Died 26 March 1919 aged 24. Buried in Bradninch churchyard extension. WR/ Sapper Victor Elliott of the Royal Engineers Railway Operating Division. Son of Henry and Susan Elliott; brother of Stanley (see above). Born in Cape Town SA in 1899. Died 11 April 1919 aged 20. Buried in Bradninch churchyard extension. 18569 Private Ernest Flay of the 2nd Battalion, the Devonshire Regiment. Stepson of John Webb and Mary Ann (formerly Flay); husband of Lucy Cora Flay of Bradninch. Born in Silverton in 1891. Died 25 November 1917 aged 27. 191948 Gunner John Force of the Royal Garrison Artillery. Son of Edith and the late William Force. Born in Bradninch in 1898. Died 6 November 1918 aged 20. 29303 Private Ernest Richard Frankpitt of the 7th Battalion, the East Yorkshire Regiment. Son of Robert and Harriet Frankpitt of Bradninch; husband of Emma Frankpitt of Countess Weir. Born in 1885. Died 2 January 1918 aged 33. 42054 Private Horace Augustus Gitsom of the 13th (Works) Battalion, the Devonshire Regiment. Son of John Pollard and the late Ellen Pollard. Born in Bristol St Philips in September 1896. Died 1 February 1917 at home aged 21. 775295 Private Philip Thomas Godfrey of the 38th Battalion, the Canadian Infantry (Eastern Ontario Regiment)and Beatrice Godfrey of Bradninch. Born in Newton Abbot in 1890. Died 11 January 1917 aged 27. 49491 Private John Griffin of the 12th Battalion, the King's Own regiment, (Yorkshire Light Infantry). Son of John and Agnes Griffin. Born in Bradninch in 1895. Died 13 April 1918 aged 23. 7606 Private John Henry Haydon of the 2nd Battalion, the Devonshire Regiment. Son of John and Margaret Haydon; husband of Kate Haydon of Kentisbeare. Born in Bradninch in 1885. Died 14 April 1917 aged 32. J21117 Able Seaman Robert Haydon of the Royal Navy, HMS Defence. 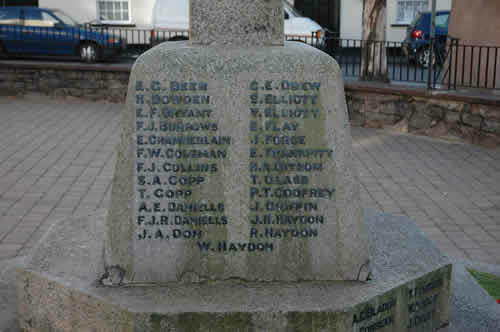 Son of John and Margaret Haydon of the "The Meaches", West End, Bradninch. Born in Bradninch 25 May 1895. Died 31 May 1916 aged 21. 7178 Private Walter Haydon of the Coldstream Guards. Son of Thomas and Mary Jane Haydon. Born in Bradninch in 1890. Died 27 August 1918 aged 28. 11530 Lance Corporal Tom Heal of the 1st Battalion, the Devonshire Regiment. Son of James and Elizabeth Heal. Born in bradninch in 1897. Died 27 July 1916 aged 19. 2nd Lieutenant Roger Paul Hepburn of the 30th Signal Company, the Royal Engineers.Son of the late Sir Thomas Henry Hepburn and his wife Lady Josephine Hepburn. Born in Bradninch in the September Quarter of 1893. Educated at Rugby School. Died 3 August 1917 aged 24. Awarded the Military Cross. 7806 Private William James Hollett of the 1st Battalion, the Devonshire Regiment. Son of James Hollett and the late Lilly Hollett. Born in Bradninch in 1886. Died 23 September 1914 aged 28. L/6656 Officer's Cook 3rd Class Leonard Jeffery of the Royal Navy, HMS Edgar. Son of Mark and Sarah Jane Jeffery. Born in Cullompton 9 November 1894. Died of illness 1 November 1915 aged 23. 226368 Gunner Walter Jordan of the Royal Horse and Royal Field Artillery. Son of Edwin and Mary Ann Jordan. Born in Bradninch in 1887. Died 26 August 1917 aged 30. 7582 Corporal Ernest John Lane of the 8th Battalion, the Devonshire Regiment. Son of Richard and Rhoda Lane. Born in Bradninch in the September Quarter of 1887. Died 26 October 1917 aged 30. 16194 Private Fred Lucas of the 9th Battalion, the Devonshire Regiment. Son of William and Bessie Lucas. Born in Bradninch in 1894. Died 6 September 1916 aged 22. 253280 Private Frank Mortimore of the 3rd City of London Battalion, (the Royal Fusiliers). Son of Frank and Sarah Mortimore. Born in Silverton in 1890. Died 20 April 1917 aged 27. 1943 Private Walter John Needs of the 1st/4th Battalion (Territorials), the Devonshire Regiment. Son of John and Sarah Needs. Born in Bradninch in 1890. Died 3 June 1915 aged 25. 260106 Private Frederick Ninnis of the 7th Battalion, the Duke of Cornwall's Light Infantry; formerly 5318, the Devonshire Regiment. (Head Master of Bradninch Boys' School.) Born in Gwennap, Cornwall. Died 27 September 1917 aged 36. 33170 Private Victor Frank Norman of the 8th (Service) Battalion, the Devonshire Regiment. Son of Francis and Eliza Norman. Born in Bradninch in 1893. Died 26 October 1917 aged 24. 43222 Sergeant Walter Pyne of the76th Bty, the 6th Division Supply Coy, the Royal Field Artillery. Son of Charles and Elizabeth Pyne. Born in Bradninch in 1888. Died 22 July 1919 aged 32. Awarded the Meritorious Service Medal. 29195 Private Thomas W Saunders of the 7th Battalion, the Duke of Cornwall's Light Infantry. Brought up in Bradninch by his uncle and aunt (brother and sister) Frederick and Caroline Lock. Born in Bradninch in 1896. Died 22 February 1917 aged 21. 95195 Gunner Richard Snell of "C" Battalion, the Tank Corps. Son of Charlotte Snell and the late George Snell. Born in Bradninch in 1891. Died 20 November 1917 aged 26. 797 Private Stanley Seymour Southwood of the 1st/7th Cyclists Battalion (Territorials). 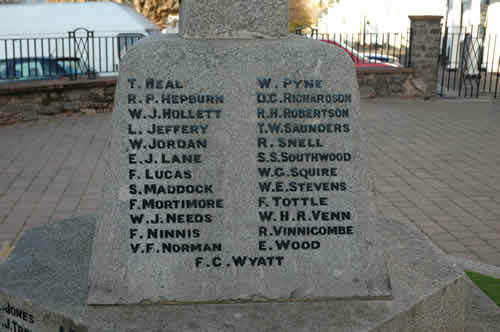 Son of Samuel and Annie Southwood of Hele. Born in Tiverton in 1898. Died 14 August 1915 at home aged 17. 241224 Private William George Squire of the 1st/4th (Territorial) Battalion, the Hampshire Regiment. Son of William and Sarah Squire. Born in Bradninch in 1890. Died 22 April 1917 aged 27. T4/039584 Driver Walter Edward Stevens of the 1st Coy, the Royal Army Service Corps. Husband of Eliza Stevens of 3 Fore Street, Bradninch. Born in Taunton in 1884. Died 22 October 1915 aged 31. 163823 Gunner Frank Tottle of the Royal Horse and Royal Field Artillery.Son of Charlotte Tottle. Born in Bradninch in 1889. Died 27 April 1917 aged 28. 33020 Private Richard Vinnicombe of the 1st Battalion, the East Surrey Regiment; formerly 18573 of the Devonshire Regiment. Son of Thomas and Sarah Vinnicombe; husband of Rose Vinnicombe of Bradninch. Born in bradninch in 1881. Died 5 October 1917 aged 36. 33147 Private Ernest Wood of the 2nd Battalion, the Devonshire Regiment. Son of William and Mary Wood. Born in Bradninch in 1894. Born 8 October 1918 aged 24. Buried in Bradninch churchyard extension. 7805 Private Frederick C. Wyatt of the 1st Battalion, the Devonshire Regiment. Son of John and Florence Wyatt. Born in Bradninch in 1887. Died 26 October 1914 aged 27. 24701 Corporal Walter William Snell of the Devonshire Regiment ; transferred to 166 Coy, the Labour Corps as 99391. Son of George and Charlotte Snell; husband of Clara Snell of London. Born in Bradninch in 1881. Died 21 May 1920 aged 39. Buried in Bradninch Burial Ground. 267686 Private Francis Vicary of the Devonshire regiment. Son of Mary Ann (w); husband of Florence Vicary. Born in Silverton in 1880. Died 6 October 1920 aged 40. Buried in Bradninch Baptist burial ground.